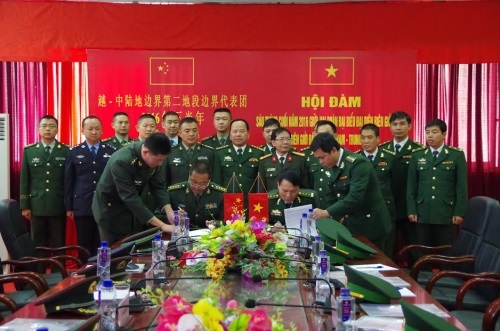 In recent years, Lai Chau - a Northwestern border province – has continuously brought into play all of its strength, resources, and potentials to foster social-economic development, strengthen defence, security and border diplomacy with a focal point on border diplomacy and people-to-people exchanges. Lai Chau shares a border of 265 km with Yunnan Province of China. Its border area covers 4 districts, 23 communes, with 10 different ethnic groups living together. This area is still in a number of difficulties, such as a low standard of living, poor transport system, the complexity of cross-border criminal activities, and the plots to break out the people’s solidarity, etc. To successfully implement the guideline on "Building and strengthening the border of peace, friendship, cooperation and development”, set out in the Resolution of the 12th Party Congress, the Provincial Party Committee has advocated bringing into play the combined strength of all levels, branches, localities, the armed forces and the entire people, with the Border Guard as the core force to promote socio-economic development, strengthen defence and security, and accelerate external relations in the border area. Attention has been paid to border guard diplomacy and the people-to-people exchanges. In pursuit of that guideline, over the years, together with the promotion of economic development, the Provincial Party Committee, People's Council and People's Committee have strengthened their leadership, worked out a number of coordinated measures to conduct these tasks, and recorded significant achievements. Notably, the knowledge of grass-roots level party committees and authorities and the people on the nation, the national border, territorial sovereignty, and border and border gate regulations has improved. The practice of briefings, discussion, information exchanges, and joint patrols (both regular and irregular) and the settlement of cases involving the border area between the Provincial Border Guard and its China’s counterpart have regularly been conducted and got practical outcomes. The two border sides twinning and exchanging activities between population clusters, people’s the relative visits, and the immigration (in accordance with the regulations and law) have been promoted. As a result, the relationships between the authorities and the people on the two sides of the border have experienced developments, contributing to the building of a border of peace, friendship, cooperation and development. Besides the positive outcomes, there have been limitations in conducting provincial border guard diplomacy and the people-to-people exchanges. The task of grasping, analyzing and anticipating the situation related to foreign affairs has not been carried out comprehensively yet; the coordination between local party committees and authorities and the Border Guard in the performance of their duties has been inadequate, etc. Meanwhile, taking advantage of the trend of integration and cooperation, and the religious policies of the Party and the State, hostile forces have dramatically stepped up their acts of sabotage, using tricks to distort information, divide the great national unity bloc, and spoil the traditional friendship between people on the two sides of the border. The situation requires the Party, the authorities, the armed forces and the people of the Province to constantly raise vigilance, achieve consistency in awareness and successfully perform the task of building, managing and protecting the national sovereignty and border security. Attention has been paid to raising awareness and responsibility of cadres, party members and the whole people towards border diplomacy and people-to-people exchanges in the border area. In order to accomplish this objective, the Province has directed its localities, branches, mass organizations and armed forces to step up the education and propagation of border-guard diplomacy and people-to-people exchanges; focusing on clarifying the role and importance of this work, especially in the context of ever deeper and broader international integration of the nation. Accordingly, all administrative levels are required to thoroughly grasp the Party's viewpoints and guidelines on border diplomacy and people-to-people exchanges as written in the Resolutions and Directives of the Party, the Government and the Central Military Commission, the Ministry of National Defence and other related ministries and agencies. Annually, the Province directs the Border Guard Commands and the People's Committees of border districts to speed up the propaganda and mobilization of the masses so as to help them improve their understanding of the territorial sovereignty of the Homeland, the national border as well as regulations on each borderline and border gate. In the implementation, flexible methods of education and propagation have been broadly used to help all subjects, particularly, local party committee and authority cadres, village patriarchs, and cadres and soldiers of border posts – who daily conduct the work – understand its importance, creating a dramatic improvement of their awareness and actions toward the work. Strengthening the leadership over the encouragement of the cooperation on socio-economic development and the consolidation of national defence and security in the border area, considering them a basis for raising the quality and efficiency of border guard diplomacy and the people-to-people exchanges in the new situation. The national border in general, the provincial border line in particular, is basically the "open" border. It is not only a national border, but also a space for cooperation with other countries, first and foremost, with the bordering country. Therefore, strengthening the cooperation on socio-economic development in combination with enhancing national defence and security is an important task. On the basis of thoroughly grasping and strictly implementing the Party's external relations views and policies, especially the 10th Politburo’s Resolution No. 22-NQ/TW, dated April 10th, 2013, the Directive No.15/CT-TTg of the Prime Minister on foreign economic cooperation, the Province has concretized them into cross-border economic cooperation plans and programs for each branch and field, attaching importance to the cooperation on the development of investment, trade, mining industry, and the border gate economy. The Province guides its localities to foster cooperation with their counterparts of Yunnan Province, China on assisting each other in farming and breeding techniques, and agricultural product consumption to jointly boost the economy and reduce poverty. The activity of friendly exchanges and twinning between villages on the two border sides, the joint cultural activities and sports have been held on a regular basis, contributing to enhancing mutual understanding and trust between the party committees, the authorities and the people on the two sides of the border. Besides, the national defence and security in the border areas have been strengthened, creating the basis for raising the quality and efficiency of external relations in general and border diplomacy in particular. Accordingly, the forces and localities have focused on the work of studying, assessing and forecasting the situation, especially the defence and security situations. They have also been active in planning and effectively conducting external affairs. For the Border Guard force, they must firmly grasp the internal and external situations and changes in each geographical area; clearly identify key areas of national defence and security; then giving advice to the party committees and local authorities and cooperating closely with China's border protection forces to effectively address emerging issues. The process of implementation must be in line with the guidelines and policies of the Party, the international practices, and regulations and laws of the two countries. It is necessary to continue to apply different forms and methods of foreign relations, such as: meeting, talks; joint patrols, cultural exchanges, visits, informing each other of the situation, and setting up hotlines in order to promptly and efficiently handle emerging issues in the border area. The Border Guard force has closely coordinated with localities, agencies, and other forces to conduct border diplomacy and people-to-people exchanges in the border area. The work of construction, management, and protection of national borders is the responsibility of both the whole political system and the people, with the Border Guard as the core force. Therefore, the close co-operation between the Border Guard with localities, agencies and other forces is a matter of importance to create integrated strength in border diplomacy and the people-to-people exchanges. In this regard, the Border Guard force has paid attention to the co-ordination with the local party committees and authorities. It has worked with the Provincial Foreign Affairs Agency, the Union of Friendship Organizations and related functional forces to grasp the situation, share information and experiences, and handle complex cases that occur along the border. The border posts and stations have collaborated with border communes and villages and households to conduct border diplomacy. In the time to come, the Provincial Border Guard force should be more active in cooperating with its China’s counterparts to effectively fight against crimes, the hostile forces’ act of sabotage, the illegal border intrusion, etc., making contribution to the management, protection and construction of the border of peace, friendship, cooperation, and development./.